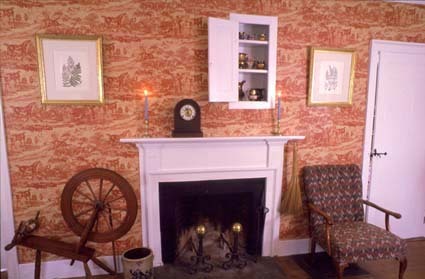 The 19th century, grain-painted headboard that once capped the tavern bar currently rests against the attic chimney. It was once imbedded in the plaster ceiling, boxing in the alcove pictured below to create a long rectangular taproom behind the two front parlors. A narrow walkway to the right of the bar allowed access to the dining room and the back staircase leading upstairs. Although the bar was disassembled many years ago after the tavern became a private residence, most of the components were saved and will someday be returned to their rightful places. In the meantime, this room functions as another fireplaced sitting room that's particularly comfy on a cold winter night. In tavern days it would have been sparsely furnished with two or three tavern tables and Windsor chairs, and customers would have traded news of the day while enjoying ''cordials.'' Old Tavern Farm customers can still enjoy a sociable drink here and choose from more than 500 CDs to sample on the custom sound system. The eclectic CD collection is heavy on new acoustic and bluegrass, with lots of Jerry Garcia and Doc Watson, but there's a little something for everyone, including oldies, 60's, pop, blues, country, and good old-fashioned rock & roll.